LANSING — Some big players in Michigan politics contributed to two Super PACs that slammed a state senator running for Congress in the days before the Aug. 2 primary, according to campaign finance disclosures released over the weekend. The target of the Super PACs’ attacks this summer was State Sen. Tom Casperson (R-Escanaba), who ultimately came in second in a three-way race for the GOP nomination in the 1st U.S. House District. Retired Lt. Gen. John Bergman, of Watersmeet, won the primary. Former State Sen. Jason Allen, of Traverse City, finished in third. In the last two weeks before the election, two Super PACs began running TV and digital advertisements against Casperson. One of committees, U.S. News Network, which lists an Alexandria, Va., address on its disclosures, reported spending $29,000 in TV advertising against Casperson. The other, Concerned Taxpayers of America, which also lists a different Alexandria, Va., address, reported spending $192,675 against Casperson. Concerned Taxpayers of America reported spending another $5,007 against Bergman on the day before the Aug. 2 election. All of that spending happened despite the facts that Concerned Taxpayers of America had only $1,388 cash on hand as of July 1 and that U.S. News Network reporting having no money at that time. Concerned Taxpayers of America ended up raising $215,500 between July 26 and Aug. 1, according to its disclosure. Of that total, $125,000 came from members of the powerful West Michigan-based DeVos family: Daniel DeVos; Douglas DeVos; Richard DeVos Jr.; Richard DeVos Sr.; and Suzanna DeVos. Two other contributions of $25,000 came from the Associated Builders and Contractors Inc. and EQCO Partners LLC, which gave a Chicago address. A group called Michigan Energy First, at a Sterling Heights address, gave $20,000 and the Fund for American Opportunity Education in Washington, D.C., gave $10,000. U.S. News Network raised $30,000 between July 1 and July 29 while spending $29,000 just before the primary. The money came mostly from John Patrick Yob, a political consultant, who has recently been described as a Bergman campaign spokesperson in media reports. 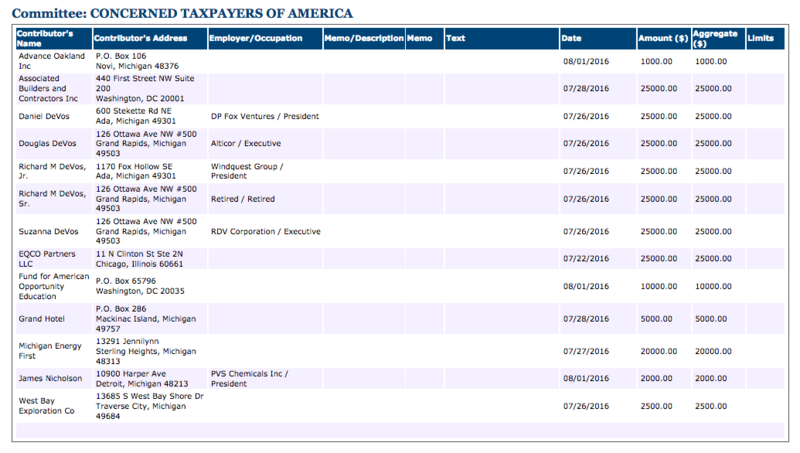 Yob gave $25,000 to the Super PAC on July 29, according to campaign finance records. The other $5,000 came from a group called Michigan’s Promise, a nonprofit with a Lansing address. After the election, McKinley Financial Partnership, a real estate management and investment firm, gave $25,000 to U.S. News Network on Aug. 15, according to disclosures. Ronald Weiser, former chair of the Michigan Republican Party, founded McKinley Financial Partnership, according to its website. 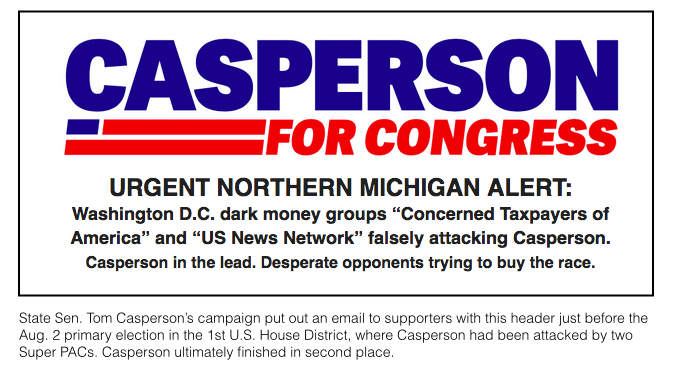 “They won’t say who they are or where their money is coming from, but since our opponents have the bulk of their donors from outside the 1st Congressional District, it seems like they are up to their usual dirty tricks,” Casperson’s statement said. Casperson received 31.9 percent of the vote while Bergman received 38.6 percent. Allen got 29.4 percent. A Super PAC also aided Casperson's efforts, spending about $202,000 to help him in the race. That Super PAC, Defending Main Street, previously reported its donors and expenditures in the 1st District race in filings made in August and September. For the month of July, Defending Main Street spent about about $177,000 in the 1st District, some of that spending was in support of Casperson while some was in opposition to Allen. In the month of August, the Super PAC spent another $25,000 against Allen. From the beginning of June through the end of August, the Super PAC’s top donors were the Air Lines Pilots Association ($100,000) and Policy Over Party, a Super PAC funded in the past by the Operating Engineers ($75,000).